We had four days to sort things out in the field station before our first day on the water on Friday. Even though many of us have been coming here for years, there are always issues at the start of the season. This year we had the usual array--setting up a computer network that everyone could see, for some strange reason a computer and a printer stopped working, a busted hot water heater--you get the idea. No matter how prepared we are, these sorts of problems are always part of the field season start up. The R/V Nereid crew loads the boat for the first survey. We had most of the bugs worked out when Moe Brown made the call to go out on Friday. The marine forecast on one weather site was not great, but going on a long history of observing the weather here, Moe went with her instincts and they were spot on. Aboard the R/V Nereid, we were able to do a thorough survey of the western side of the Bay of Fundy. 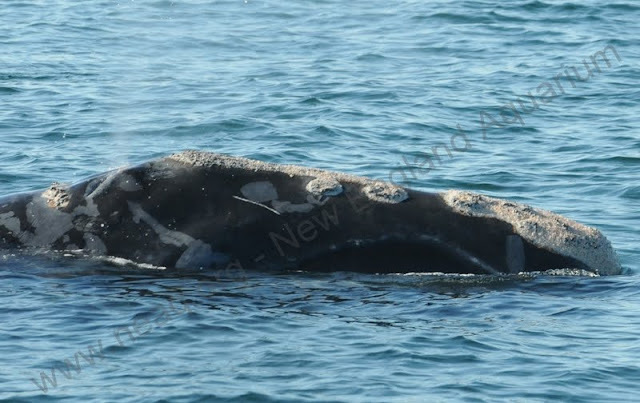 We found two lone right whales in separate locations in the Bay--both were young whales that appeared to be feeding at, or just below, the surface of the water. Normally, right whales in the Bay feed many hundreds of feet below the surface. Our first right whale of the day, surface feeding in the Bay of Fundy. 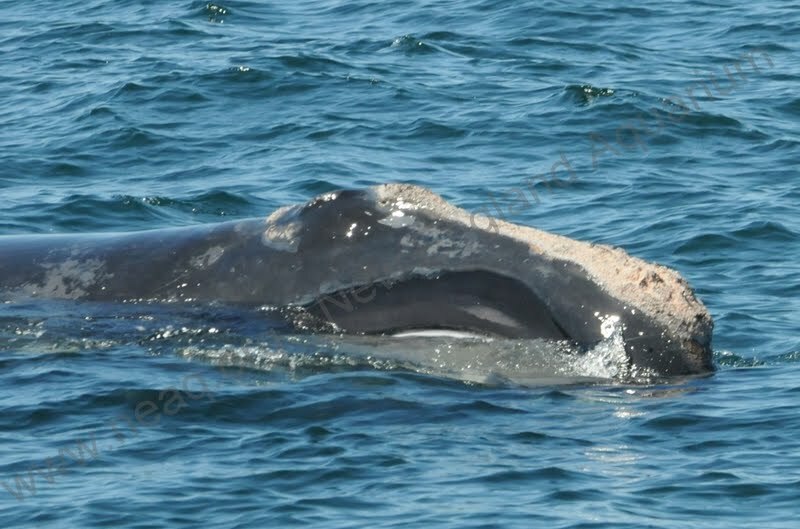 The second of the two whales is a whale that has only been seen off the coast of the southeastern U.S. and is not in the catalog yet--it is only referenced with a temporary code of S048. We sighted it 13 miles north of the area that we usually survey. We were able to collect an important skin sample from this whale which may allow us to identify it to a calf born in recent years. It was a great first day on the water. We were treated to many sightings of ocean sunfish (Mola mola)- one of the oddest looking creatures in the ocean (see picture below). These fish are generally associated with warmer waters and it is relatively rare to see them in the Bay of Fundy. An ocean sunfish in the Bay of Fundy. Although we only had two right whale sightings, the R/V Callisto conducting the mother/calf (m/c) studies found 2 m/c pairs to the east and saw other right whales in the distance even further to the east. Now- we just have to wait for the fog to clear and the winds to subside for our second day on the water! #5: First SAG of the season! #4: Plenty of whales in the sea! #2: Fiddling, stream-lining, and refining.